﻿D﻿als or lentils are perhaps the most common and popular food of India, They are relished by the rich and the poor alike. Dal and rice combination is one of the staple foods in every region of India and practically cooked daily in almost every Indian home. Dal is a comforting food is what soup in west. Dals provides the necessary proteins and dietary fiber for a balanced diet and are low in fat. In North India it is the main course of lunch and served with vegetables and chapattis, in southern India it is regularly eaten with rice and primarily used to make sambar combined with vegetables and tamarind. 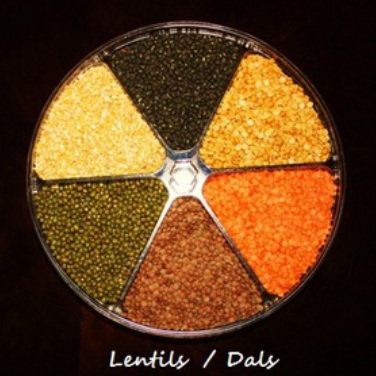 Lentils or dals come in many varieties and are cooked with many flavors. They can be liquid like a soup or thick like a stew. Each region in India has its own favorites and cooking methods. But most Dal recipes are quite simple to prepare. The standard preparation of dal is boiling the dal with water, turmeric and salt and then adding a cumin seed and asafetida tadka at the end of the cooking and before serving add hot oil tadka. Lentils like beans generally take long cooking time, but cooking with pressure cooker is convenient and can save you a lot of time. If you are going to cook lentils often it would be a good idea to purchase a pressure cooker. All most every Indian home has a pressure cooker. 1. You do not need to soak dals for long time and they are cooked much quicker. 2. You do not need to add lot of water. immediately and you can open the cooker. need to be soaked overnight. 2. Add salt after lentil are cooked, with the salt it takes longer to cook. start spilling out and the stove will be a mass. 4. With the cooking spoon try to remove the foam from the top as it is building. cover the pan and cook. 7. Slow cooker can be used for cooking the lentils. Some dals are hard and they take long time to soak and cook and you have to plan ahead but do not worry follow the following instruction to soak the dal quickly. 3. Drains soak water and rinse dal. dal. Lemon juice or mango powder (amchoor) is also used to enhence the flavor. There are common tadka ingredients are used all over India such as mustard seeds, mango powder (amchoor) onion, garlic, tomatoes, ginger, coriander leaves, ginger, tamarind, curry leaves, coconut and Sambar powder. There is innumerable variation and one can create their own individual taste. ﻿Please take the time to let me know what you think about my North Indian popular Dal /Lentils recipes. Your comments would be helpful to me to improve the recipes.